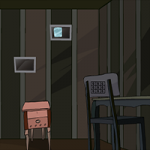 GFG Abandoned Mansion Escape 2 is another point & click escape game developed by GenieFunGames. In this game, you have been trapped in a dangerous abandoned mansion - again! You are aware of the fact that this place is abandoned, but something happened that you didn't remember anymore, and now you are confined at this place! But there is no time to remember now... Find a way to escape quickly! You already know about this place being very dangerous to enter, so locate the exit by finding useful and interesting stuff: objects, clues and symbols to solve puzzles in order to finally escape from the abandoned mansion. Good luck and have fun! Sometimes, easy and short is just what I am looking for, though. I also judge by things such as whether the hot spots are big enough and clues make sense, i.e., is there enough distinction between purple, lilac and pink. I also give fewer stars to games that make me go back and forth through a maze too many times to get from a clue to the place it is used, and by then I've forgotten the clue. I do understand what you are saying; so I might not give it a 5, but I don't think a 4 would be wrong, either.